Yes, it is France again. Perhaps this love of France proves I’m not really a nerd. I do like the Somme estuary for all sorts of reasons. Some might see it as a flat, dreary landscape, but I see it as a wondrous panorama of light and gentle colours. We know just where to go for a pretty well guaranteed sighting of seals. We can enjoy the bird life both within the bird park at Parc du Marquenterre and more generally. We’ll enjoy wandering the estuary to find what we call ‘the sheep of the mud holes’. That was a poor bit of computer translation about the sheep that feed on the brackish lands around the Somme. On the south side of the estuary, Saint Valery sur Somme is a lovely town whilst on the northern banks of the mighty Somme Le Crotoy is very pleasing. We also found, on longer journeys, that the Baie de Somme services on the motorway, near Abbeville are a cut above the average UK service station. It’s a suitable distance after leaving the ferry at Calais for a break and a breather. Climb the distinctly ugly observation tower for a view over the whole Baie de Somme area. But now to be a nerd again. 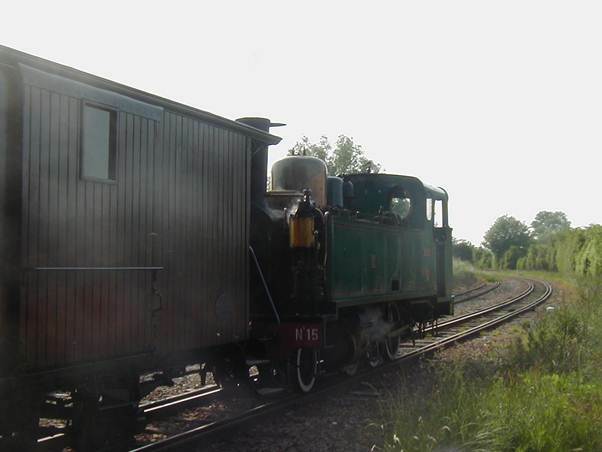 An attraction rarely seen by me, for we tend to travel out of season, is the narrow gauge steam railway. It has two branches starting at Noyelle sur Mer (but a long way from the sea). One goes to Saint Valery and the other to Le Crotoy. 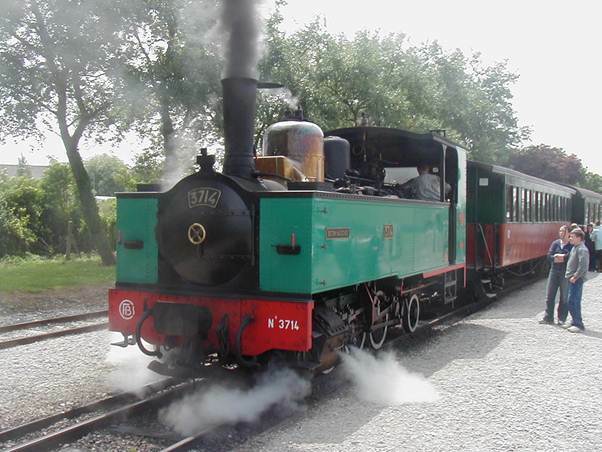 The railway caters for fans of steam by having two trains starting at Noyelle at the same time. 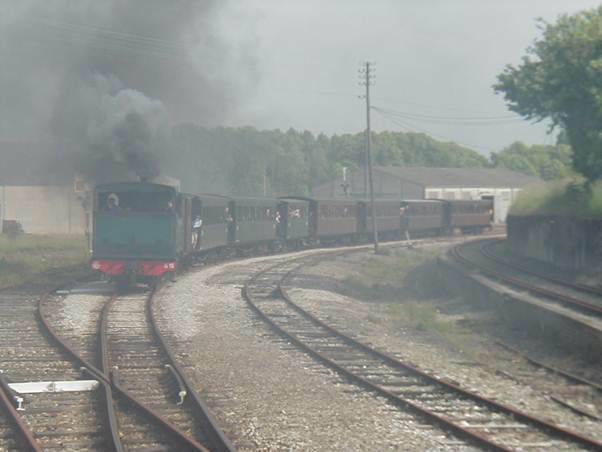 As they run more or less alongside each other, speeds are changed so that one train overtakes the other and then is overtaken again. 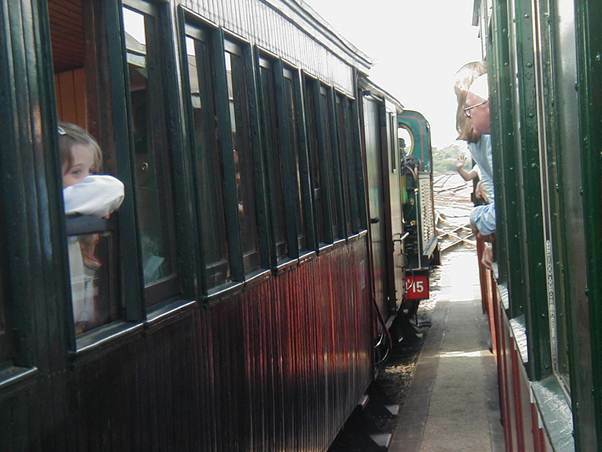 It’s a fantastic experience as we found in June 2004. 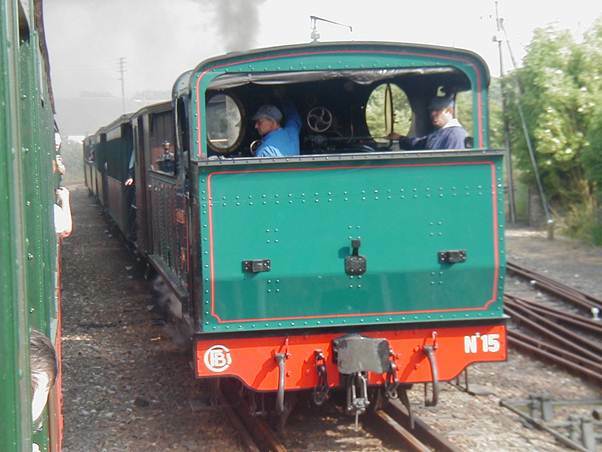 This is the train at Le Crotoy where we joined. 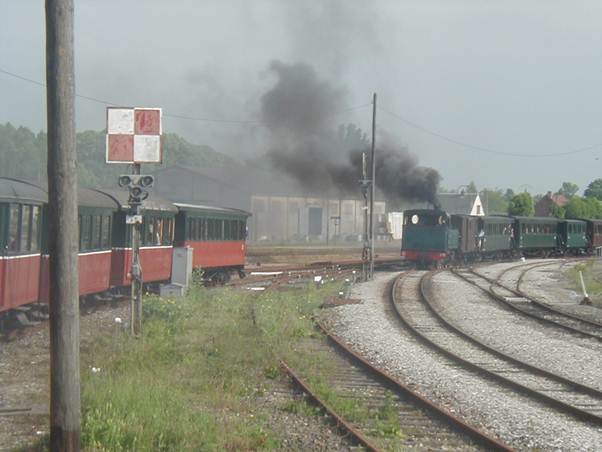 Two trains alongside each other at Noyelle. I’m on the train on the left – it goes around quite a curve. The other train is chasing us. They don’t seem to use the cleanest fuel – but we are being overtaken. I’ll commend it as a wonderful experience. It was much loved by children as well.